The Chennai Super Kings' loyal fans were in attendance to cheer their team which returned to its den after a gap of 2 years. However, CSK's fans were silenced in the first half by Kolkata Knight Riders' Andre Russell (88 no) whose 36-ball massacre helped his side finish on 202/6. But as the match ended, the smiles were back. CSK chased down a stiff target, scoring 205 for 5 and sealing the deal in the penultimate ball of the contest. The hosts were kept in the hunt right till the end thanks to a 23-ball blitz by Sam Billings (56). In the company of MS Dhoni (25) Billings added 54 from 30 balls for the fourth wicket that gave wings to CSK's chase. Despite losing Dhoni in the 17th over, Billings continued to strike lusty blows to bring down the equation down to 27 off the last 12. Once Billings was dismissed, caught by Robin Uthappa off Tom Curran (2-39), Dwayne Bravo (11) and Ravindra Jadeja (11) ensured the Men in Yellow walked away as victors. Vinay Kumar (0-35) had a night to forget as he failed to contain 17 runs in the final over. CSK teed off with Shane Watson (42) and Ambati Rayudu adding 75 for the opening stand in 35 deliveries. Once Watson departed, caught at mid-wicket region by Rinku Singh off Tom Curran (2-39), the chase ran into rough weather. Rayudu (39) soon departed, caught by substitute Shivam Mavi off Kuldeep Yadav, and CSK were placed at 85 for 2 in the 9th over. At half-way mark, CSK were 113 away from the target. Suresh Raina (14), dropped on 6 by Curran off Kuldeep Yadav in the 11th over, failed to capitalise the miss and added just 8 more to his individual score to leave CSK on 101 for 3 in the 12th over. From thereon, Dhoni and Billings took over and helped the side stay in the mix. The first half of the evening belonged to the merciless Russell who single-handedly helped KKR finish off in style after being inserted in. The KKR all-rounder walked in with half of his side back in the dugout with just 89 on board in the 10th over. A fierce drive over covers for a four in the 12th over bowled by Shane Watson got the Jamaican going. Interestingly, that was the only four Russell was to score since he preferred to fetch runs through sixes. The 29-year-old was happy to face the medium pacers. He took special liking for Dwayne Bravo and Shardul Thakur, from whom he accrued 41 and 27 runs respectively. Russell, in the company of skipper Dinesh Karthik (26) added 76 runs in 46 balls for the sixth wicket to give momentum to KKR's innings. It was perhaps rain that was forecast which made skipper Kane Williamson chase down a target, but he was vindicated as Sunrisers Hyderabad came up with a top notch performance to get their IPL-XI campaign off to a winning start. With unseasonal rain that battered the city over the last two days mercifully staying away, the Rajiv Gandhi International Stadium in Hyderabad witnessed the Sunrisers complete a nine wicket win by finishing at 127 for one, Shikhar Dhawan (77 no) and Kane Williamson (36) complementing the fine show of their bowlers, who had restricted Rajasthan Royals to 125 for nine on Monday. Rajasthan struggled to put together largely due to their own lack of enterprise – there were only 12 boundaries – in their innings that lacked thrust at the top and suffered for want of momentum thereafter. For a change, SRH spearhead Bhuvneshwar Kumar was unsuccessful in the first spell and conceded a few. But Rajasthan still struggled to break free of the shackles imposed by the tall Billy Stanlake, left-arm spinner Shakib Al Hasan (2/23), Afghan leggie Rashid Khan and the successful Siddharth Kaul (2/17). Mohali: Kings XI Punjab mentor Virender Sehwag had promised entertainment and aggression before the start of the match. And, the jampacked crowd at Mohali's PCA Stadium was provided with both by KL Rahul as the Punjab side brushed aside Delhi Daredevils by 6 wickets in the second match of this year’s Indian Premier League (IPL) on Sunday. Chasing 167, Rahul smashed the fastest IPL fifty off just 14 balls. The Karnataka opener attacked spared none - in the first over, he thumped Trent Boult for 16 runs; then belted Mohammed Shami for 12 runs in the second over. The best was reserved for Amit Mishra, who leaked 24 runs in the third over of Kings XI's innings. Rahul's (51 off 16b) assault on Mishra included three boundaries and two sixes. He was dismissed off a Boult full toss. Kolkata Knight Riders had roped in Nitish Rana to provide stability to their middle-order. He did that job well by playing a useful 25-ball 34, but more than that as a bonus, the Delhi batsman provided his new team two vital breakthroughs with his part-time off-spin to help hosts beat Royal Challengers Bangalore by four wickets with seven balls to spare in their opening match of IPL-11 at the Eden Gardens on Sunday. KKR have a new team and a new skipper, but there was no change in their game. Sunil Narine once again opened the innings providing the initial fireworks after their spinners – Yadav, Piyush Chawl, along with Narine kept things tight to restrict RCB to 176 for 7 when skipper Dinesh Karthik opted to bowl first on winning the toss. The sight would have left the Mumbai Indians dugout seriously worried. Hardik Pandya was being helped off the field after writhing in pain following a collision with Dwayne Bravo, while trying to finish a single off the last ball of the MI innings. Till that point of concern, though, MI did reasonably well to launch their campaign by posting 165/4 in the opening game of the league at the Wankhede Stadium on Saturday night, after being put in to bat by Chennai Super Kings, returning to the IPL after a two-year ban. 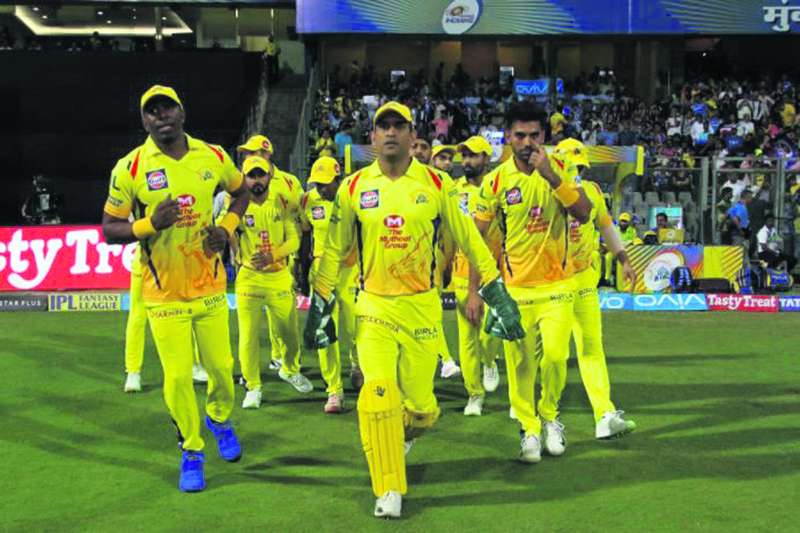 CSK started poorly, losing early wickets and then Kedar Jadhav limped back to the dugout due to a thigh injury midway through the chase. It looked curtains for CSK, but Dwayne Bravo decided to turn the match on its head. He took the Mumbai bowlers head on, smashing 68 off just 30 balls with Imran Tahir giving him company. Then, with just seven runs needed off seven balls, Bravo was out bringing the injured Jadhav to face the last over. With three balls to go, Jadhav hit a six over fine-leg, going down on his knees. He then hit the next one for a four through covers to clinch a thrilling win for Chennai.